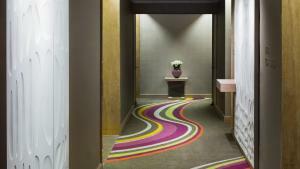 You will find a 24-hour front desk, concierge services, and hairdressers. The hotel also provides car rental. 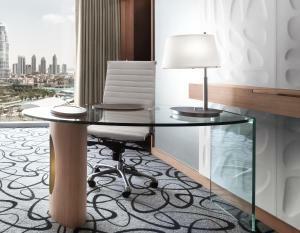 Dubai International Convention and Exhibition Center is 4.1 km from Sofitel Dubai Downtown, and Safa Park is 3.7 km away. Dubai International Airport is 15 minutes by car from Sofitel Dubai Downtown, whist Abu Dhabi International Airport is a 90 minutes' drive away. Please note that adjacent to the property, a new mixed use complex is being built. 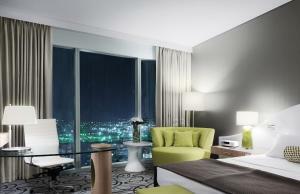 Hence, guests might experience some disruption to the Burj Khalifa view from some of the property hotel rooms and suites. 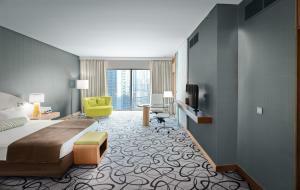 Please inform Sofitel Dubai Downtown in advance of your expected arrival time. You can use the Special Requests box when booking, or contact the property directly with the contact details provided in your confirmation. Guests are required to show a photo identification and credit card upon check-in. Please note that all Special Requests are subject to availability and additional charges may apply. Payment before arrival via bank transfer is required. The property will contact you after you book to provide instructions. 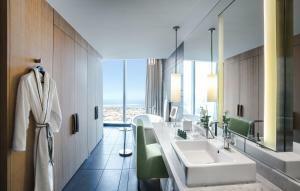 A masterpiece suite, king size bed, separate living room with partial Burj Khalifa view and Downtown view, free WiFi, HD TV, optimum comfort: My Bed, working space, a Nespresso™ coffee machine and a BOSE media station. 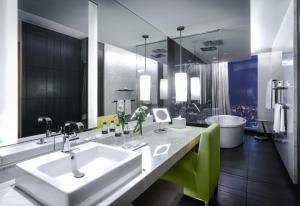 It also includes a spacious bathroom with separated shower, bath and luxury amenities. Executive Lounge access. 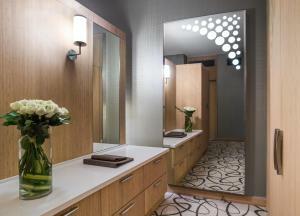 A separate guest bathroom is also available. 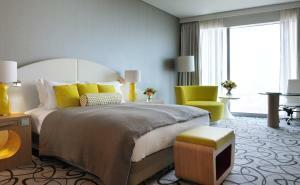 This suite provides a free roll-away bed, subject to availability. 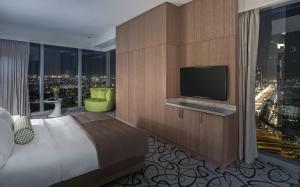 A masterpiece suite, king size bed, separate living room with partial Burj Khalifa view and Downtown view, free WiFi, HD TV, optimum comfort: MyBed, working space. A Nespresso™ coffee machine and BOSE media station. 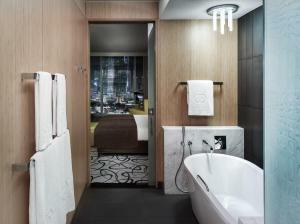 It also includes a spacious bathroom with separated shower, bath and Lanvin amenities. 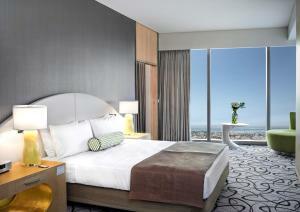 Guests booking this suite are also entitled to Executive lounge access. 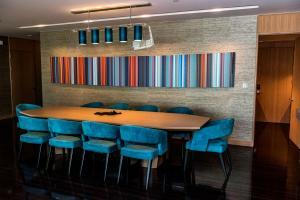 This suite can connect to a twin room and provides a free roll-away bed, subject to availability. 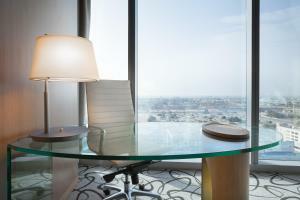 Warm and elegant contemporary design, with partial Burj Khalifa view and Downtown view, free WiFi, HD TV, optimum comfort: MyBed, working space, a Nespresso™ coffee machine, BOSE media station. 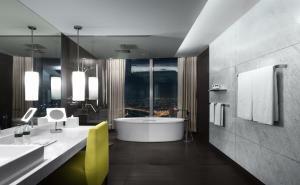 It also includes a spacious bathroom with separated shower, bath and luxury amenities. Complimentary Breakfast is included. 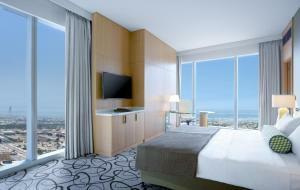 Guests booking this suite are also entitled to Executive lounge access. 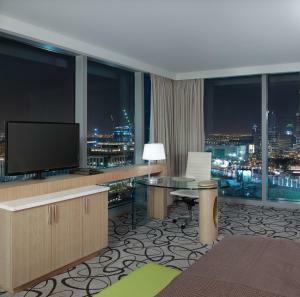 This elegantly designed room offers views of the coastline and Sheikh Zayed Road. 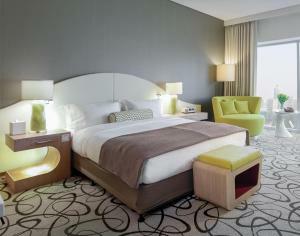 It includes free WiFi, a 40-inch flat-screen TV, a Nespresso™ coffee machine and BOSE media station. A minibar is also available. 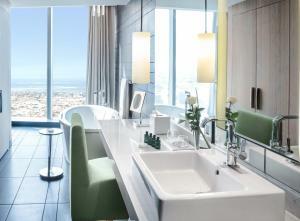 The bathroom enjoys its own window with a sea view and is fitted with a soaking bath, a rain shower and luxury amenities. This room can connect to the Prestige Suite. This room can accommodate 2 adults. 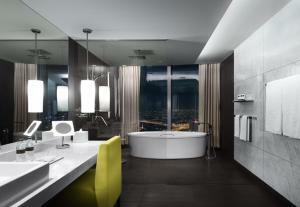 This suite features a partial Burj Khalifa view. 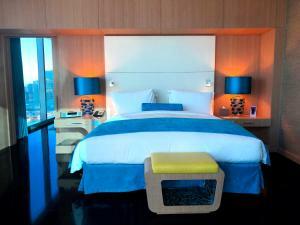 It offers minibar and bathrobe, air conditioning, a satellite TV, separate living room, unique comfort: MyBed, Luxury Amenities, Bose System, free WiFi, and coffee machine. 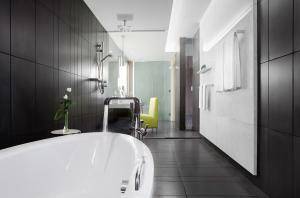 The private bathroom includes a shower, luxurious bath amenities and a separate tub. 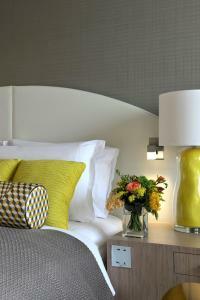 The suite includes Executive lounge access and complimentary airport transfers. 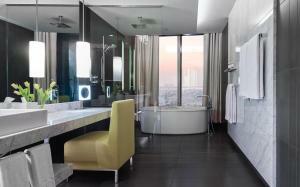 This suite features a partial Burj Khalifa view. 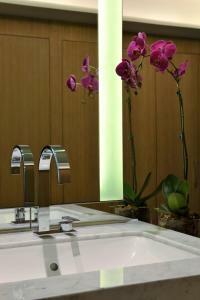 Shower, luxurious bath amenities. 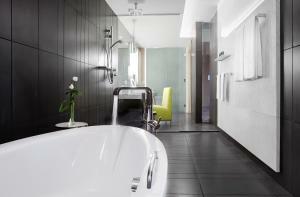 Executive lounge access, and separate tub. 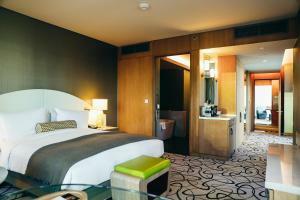 It offers minibar and bathrobe. free WiFi, separate living room, Large bathroom, unique comfort: MyBed, a satellite TV, Hermes or Lanvin amenities, Bose System, and coffee machine. 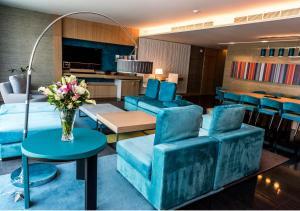 Guests staying in this suite can also enjoy complimentary airport transfers. This suite has a soundproofing, iPod dock and cable TV. 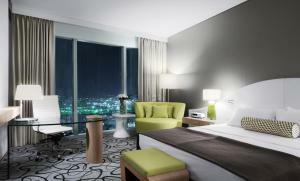 This elegantly designed room is a masterpiece family suite offers views of the partial Burj Khalifa View . 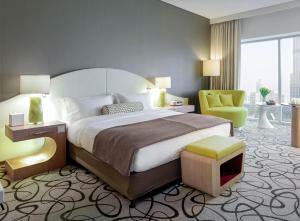 It includes free WiFi, a 40-inch flat-screen TV, a Nespresso™ coffee machine and BOSE media station. A minibar is also available. 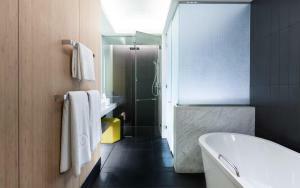 The bathroom enjoys its own window with a sea view and is fitted with a soaking bath, a rain shower and Luxury amenities. This room can accommodate 4 adults. 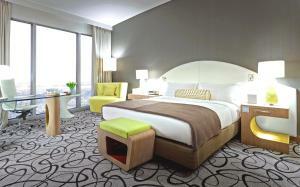 With Complimentary Breakfast and Airport Transfer. 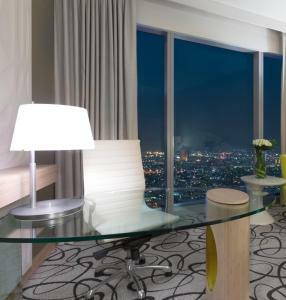 This elegantly designed room offers views of the partial Burj Khalifa View . 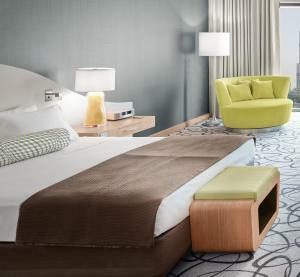 It includes free WiFi, a 40-inch flat-screen TV, a Nespresso™ coffee machine and BOSE media station. A minibar is also available. 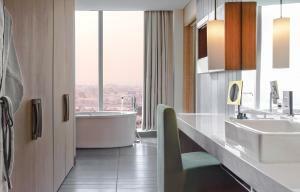 The bathroom enjoys its own window with Downtown view and is fitted with a soaking bath, a rain shower and Luxury amenities. This room can accommodate 2 adults. With Executive lounge access. 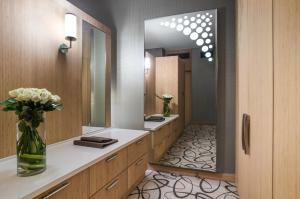 This suite has a minibar, soundproofing and bathrobe.